The Pygora Breeders Association was established in 1987. The PBA has it's own breed registry which requires all animals to meet the Pygora goat breed standards and it also includes a fleece grading of each animal before it can be permanently registered. Pygora goats are a specialty goat with multiple uses. 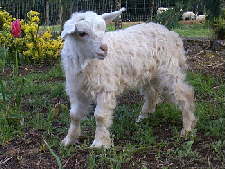 Pygora goats are growing in popularity for their unique fiber and friendly disposition. Pygora goats are great for the small farm. They are great with kids, produce wonderful hand spinning fiber, and are wonderful brush eaters. They are fun loving and always curious. 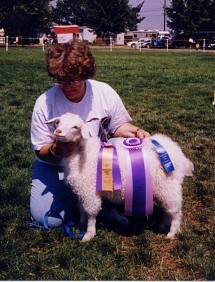 Pygora goats are easy keepers, easy kidders, and easy to handle because of their smaller size. Pygora does can weigh from 65 - 75 lbs. 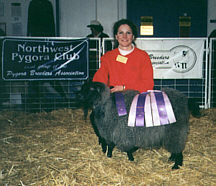 Pygora Buck's and Wethers from 75-95 lbs. They can produce up to a quart of milk a day and make great sociable and lovable pets as well as produce downy-soft fiber too! Pygora goats are easy keepers and dont require any special feed besides grass hay when fresh grass is no longer available. We also offer all of our livestock free-choice mineral salt (with Selenium if you live in the Pacific Northwest). It's always wise to check with your local county extension office to find out about any deficiencies that might be in your area. Of course, you can still spoil them with a little grain! Our Pygora goats are "grain-trained". If we need to gather them up, a shake of a plastic pop bottle filled with grain will have the goats following us anywhere. If you are going to feed your Pygora goats grain, we recommend grain without molasses in it as this can cause problems in your wethers and bucks. We will "flush" our Pygora does with grain before breeding season and again right before kidding season begins as the Pygora does may need this extra energy at these times. We might also grain our does if it is a long, cold winter. This website and it's contents including all text, photos and graphics, are copyright of Hawks Mountain Ranch 2014©. Please request permission for use of any of it's contents. Thank you!